PVCC's 2019 scholarship fundraiser ROCK 'N' ROLL SYMPHONY raised over $5,000 for student scholarships in the Fine and Performing Arts. The show featured 17 classic and modern rock songs and was performed by 30 musicians including PVCC music faculty, PVCC students, PVUSD high school music faculty, PVUSD high school students, members of the North Valley Symphony, and adult musicians from our community. If you missed the show but would like to donate to the Fine And Performing Arts Student Scholarship Fund, contact Jessi Wright, PVCC's Director of Development & Community Relations. 1987 is the 30th Anniversary of the founding of Paradise Valley Community College and the PVCC Faculty Rock Band will join in on the celebration by presenting some of the biggest hits from that year. The concert, featuring very special guest vocalists, will include songs by R.E.M., Guns N' Roses, U2, Bon Jovi, INXS, Heart, Crowded House, The Bangles, The Cure and much more! All proceeds from this concert will benefit the Alice Cooper's Solid Rock to PVCC Pathway Student Scholarship Fund. Click HERE to purchase tickets online. The Center for the Performing Arts Gallery is pleased to announce Otherness: Work by Dain Q. Gore and Danielle Wood. The artwork will be on view from September 11 - October 13, 2017. 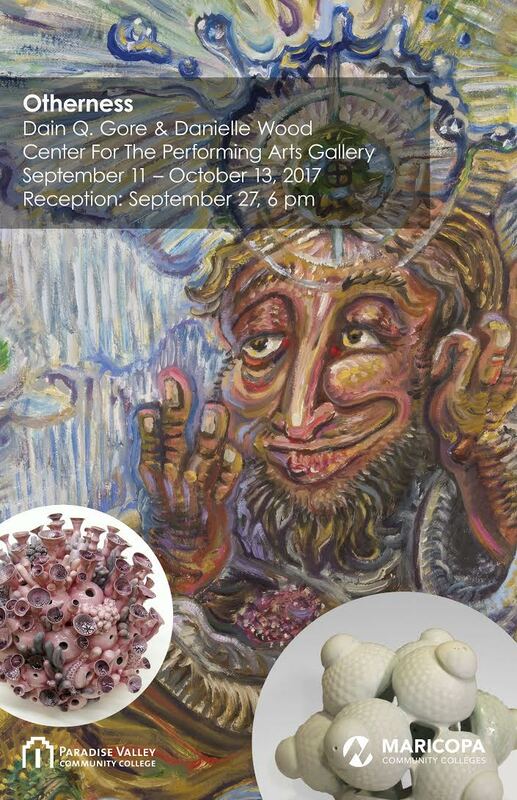 The reception is Wednesday, September 27, at 6pm. The reception is open to the public; light refreshments will be served. The CPA Gallery is open and free to the public, Monday through Friday, 9am - 5pm. Parking is available on the NE side of the CPA. Gore is a painter who studies obscure stories of many cultures. He presents cosmic myths mixed with apocryphal and controversial philosophies in a humorous way. Wood conceptualizes the ocean as a surreal metaphor for the subconscious. Her work intertwines forms of biology, but she does not pursue to render specific species, but rather pure abstractions of forms in nature from a variety of habitats spliced or collaged with mixed media, inspired by conscious and subconscious patterns that evolve. February 2, 2017 at 7:30pm. $6-$12 admission. Center for the Performing Arts. Join the PVCC Faculty Jazz Ensemble as they perform new arrangements of songs from the Beatles’ 1966 album REVOLVER. March 10-11, 2017 at 7:30pm, March 12, 2017 at 2:00pm. $8-$20 admission. Come and witness the Beatles' legendary album performed live by the PVCC Faculty Rock Band, Special Guest vocalists and a 20 piece orchestra. Proceeds from this event will benefit the Paradise Valley Community College Student Scholarship Fund. The Maricopa Community Colleges Foundation (MCCF), the fundraising arm of the Maricopa County Community Colleges (MCCC), each year recognizes MCCC employees who have made outstanding contributions to the MCCC District's mission. This year, five awards were made to individual employees at a luncheon held April 28, 2015 at the Foundation’s offices. Dr. Stephen Helfgot, CEO/President of MCCF presided over the luncheon and remarks were made by Dr. Rufus Glasper, Chancellor, MCCC and Heidi Schaefer, Chairman, MCCF Board. Congratulations to PVCC's own Dr. Christopher Scinto, Division Chair of Fine and Performing Arts, who was one of the five honorees. Under Dr. Scinto’s leadership students have flourished and demonstrated success in the arts; significant community partnerships and notable scholarships. In just the last five years, PVCC Center for Performing Arts has provided over 625 performances, drawing over 69,000 community attendees. Through various benefit events, more than $40,500 has been raised for Fine and Performing Arts scholarships. Christopher Scinto's compositions have been featured on music festivals in Germany, Italy, Spain, and throughout the United States. His works, performed by the ASU Symphony Orchestra, the Cleveland Chamber Symphony, the NYU New Music and Dance Ensemble, and the Phoenix Chorale, have received awards and grants from the Long Island Composer's Alliance, Meet the Composer, the MidAmerican Center for Contemporary Music, and the National Association of Composers, USA. He holds degrees from Arizona State University (BM & DMA) and Bowling Green State University (MM), where his studies included composition, saxophone performance, and conducting. Currently, he is completing a work for saxophone and percussion, titled Octet, and is collaborating with nationally acclaimed poet and PVCC faculty member Lois Roma-Deeley on an opera, The Ballad of Downtown Jake. In addition to his artistic pursuits, Scinto is the Division Chair of Fine & Performing Arts at Paradise Valley Community College and is the founder and artistic director of the contemporary music ensemble Crossing 32nd Street. The Division of Fine & Performing Arts is pleased to welcome back Grupo Liberdade for an evening of music from Brasil. Held on Saturday, March 28th @ 7:30pm, this event is our annual Fine & Performing Arts Fundraiser with a silent auction beginning at 6:30pm. Grupo Liberdade is a performance group dedicated to freedom of expression through Culture, Movement & Sound. We promote COMMUNITY, DIVERSITY & EMPOWERMENT drawing upon the traditional & contemporary rhythms of Brasil and beyond while bringing an original sound & energy to our desert metropolis. Specializing in Batucada including the Afro-Brazilian styles of Samba, Samba Reggae, Côcos and Maracatu, Grupo Liberdade strives to share the infectious sounds of Brasil with Arizona to further enrich, move & inspire. Silent Auction begins at 6:30pm. Musical Performance begins at 7:30pm. *$4 additional ticket fee at the door 1‐hour prior to performance. The Division of Fine & Performing Arts at Paradise Valley Community College provides courses and special events as well as an artist's community for students in Phoenix, AZ. Five totems decorate the Ceramic Studio walkway, made of PVCC student answers to the question, "Who am I?"